Stand Up Paddle Surfing: The Path to Conejo. 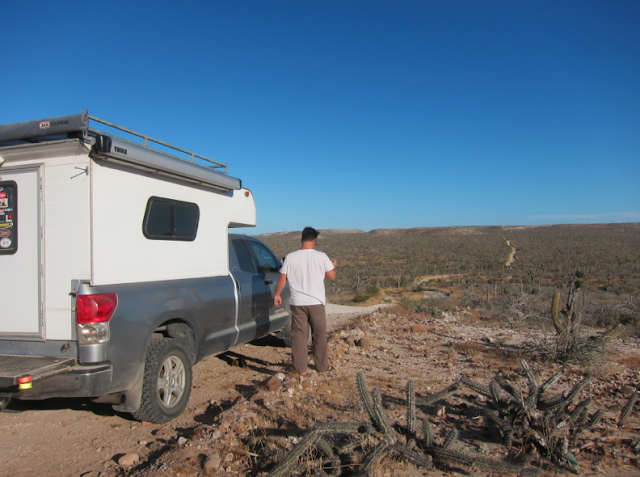 Driving up and out of the Sea of Cortez is one the best parts of the trip. There's the sapphire blue of the water over your left shoulder and, as you drive past Loreto, the craggy mountains just to your right. This area tends to get a lot of rain in the summer so those jagged peaks are always specked with giant green cardon cactuses, thick trunked elephant trees and other cool desert plants. It's a beautiful area. This day would be a medium length day of about four hours to our next stop, the big left point break of Punta Conejo. The road into Conejo, drop your tire pressure and take it slow- there are blind curves and sharp rocks... and you're a long way from help. When it's breaking, and the wind isn't cranking, Punta Conejo is one of my favorite waves. It's not hollow, gnarly and fast so if you're a short board ripper you might be disappointed. It is, however, a cobble bottomed, left point break that has enough power and a long enough tapering wall to allow you to get really jamming down the line. And the wave can be long. I've surfed over a hundred yards many times. On special days I've stretched waves all the way from the top of the point down into the fish camp which is probably three hundred yards of leg burning, left handed fun. It's a favorite of mine- if it's on. Unfortunately, the surf gods decided that I'd have to work a little harder for my waves. The surf was only fun for one morning session. I paddled out on my 9'0 stando and snagged anything I wanted since I was surfing all by myself. I only came in when I'd surfed close enough to camp to smell breakfast being made. It was a perfect morning. Dakotah giving path goers a little advice on their travels. Although the surfing was not so hot this time at Conejo, the camping, as usual at Conejo, is really good. With four wheel drive, I can drive out onto the sand berm away from the cliffside surf/camp ghetto to where there's tons of firewood within easy reach and clean white sand. Watching surfers walk past our camp we noticed that the walk up to the point was a bit of a slow process. This was due to the broken oyster shells, sticks and sharp rocks that had to be navigated in bare feet to get to the paddle out point. Dakotah and I quickly decided to help out the surf community by building a clean sand footpath. We collected rocks, cleared a path and hand-sifted the sand to make sure anything sharp couldn't poke a barefoot. It took us a whole morning but we built a really nice little path, everybody was stoked on it and we had fun doing it. Each time somebody walked our path it made us happy to have made a great spot just a little bit better.